Retail, an ever-evolving industry, requires remodelling of strategies to capture the right consumers in the right place at the right time. The old business model of brick-and mortar, huge promotional billboards and sales gambits no longer work effectively in gaining a foothold in the industry. Online marketplaces are the new frontiers. Easy, fast, cheaper overheads and conveniences are driving the smartphone generation to abandon the merry of weekend mall visits. But mall owners are fighting against these institutions, which have been part of the modern civilisation, to remain relevant with physical malls that offer a lot of creative attactions, as well as great bargains. Sunway Shopping Malls COO Kevin Tan Gar Peng said malls today are developing into a lifestyle destination providing experiences of shopping, leisure and dining under one roof. “Shopping malls these days are not perceived as only a marketplace to buy and sell goods. They are also a social place for rendezvous dining and to fulfil leisure wants. “Mall tenants are adapting to meet and reflect these changing lifestyles and needs, as well as wants of shoppers,” he said. Kevin said consumers’ lifestyle and spending power have changed in the last few decades, fuelled by growing aptitude and consumers’ wealth. “People are widely travelled with the increasing popularity of budget airlines, and thus, exposing themselves to sophisticated cultures and discerning experiences. “Besides, the e-commerce platform also serves as one of the many disruptors that are changing the buying pattern and behaviour of consumers. “However, the penetration into the retail industry is still relatively at a low percentage, but it is enjoying a substantial growth,” he said. The overall retail performance registered a moderate growth of 3.1% in 2017 and is expected to grow 4.7% this year, according to the Malaysia Retail Industry Report. “As far as this region is concerned, shoppers still prefer the superior experience and security of in-store shopping, and the personalised services provided. “Online and off line buying experience is converging to facilitate different buying preferences,” he said. The “Global village” concept has played a fair role to change the local retail landscape as consumer behaviour shifts faster than ever. 28Mall.com CEO Fione Tan said consumers nowadays are better informed via the massive online sources. The next generation of retail stores in Malaysia is expected to maintain their regular shoppers by integrating new technology to provide a unique shopping environment. Fione said it will be a fatal mistake for companies, including established brands, to sidestep e-commerce as online competition grows. “There are still many business owners who resent e-commerce, despite falling sales and the rising demand of online services. As the dimming of yesteryear malls light paths to new ones, embracing digital marketing strategies by appearing more in online platforms will create bigger results and save the retailers from the expenses of huge retail outlets. “The brick-and-mortar stores and online retailers can complement each other rather than being direct competitors,” she said. “We work closely with offline retailers and see it as an offlineto- online, and vice versa, concept. “There are many retailers who have seen success with the launch of online stores, which set them in a 24-hour conduit to sell to consumers worldwide, compared to physical stores,” she said. The impact of the lower online prices is also massively changing consumer buying patterns. “Cross-border e-commerce offers a wide range of overseas products, which might be cheaper without the Goods and Services Tax (GST). “Some local traders have doubled or even tripled the selling prices of imported products, while the same items are sold at lower prices from reputable online shops. “At the end of the day, what consumers want is to get more mileage for their money and will choose the best deals which suit them,” Fione said. She said Malaysian shoppers are still skewed towards shopping offline, although online shopping is trending globally. Revolution is part of the business cycle due to economic expansion and contraction, as well as the consumers’ behavioural changes. 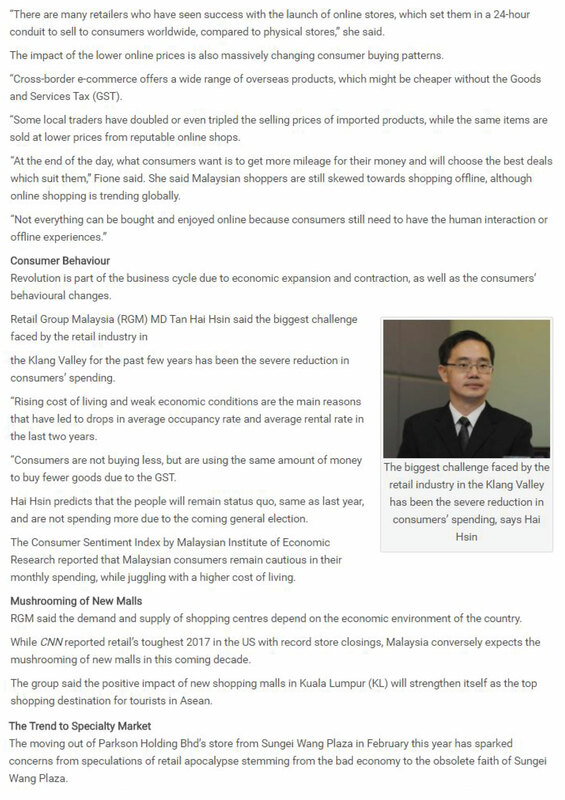 Retail Group Malaysia (RGM) MD Tan Hai Hsin said the biggest challenge faced by the retail industry in the Klang Valley for the past few years has been the severe reduction in consumers’ spending. “Rising cost of living and weak economic conditions are the main reasons that have led to drops in average occupancy rate and average rental rate in the last two years. “Consumers are not buying less, but are using the same amount of money to buy fewer goods due to the GST. Hai Hsin predicts that the people will remain status quo, same as last year, and are not spending more due to the coming general election. The Consumer Sentiment Index by Malaysian Institute of Economic Research reported that Malaysian consumers remain cautious in their monthly spending, while juggling with a higher cost of living. While CNN reported retail’s toughest 2017 in the US with record store closings, Malaysia conversely expects the mushrooming of new malls in this coming decade.The group said the positive impact of new shopping malls in Kuala Lumpur (KL) will strengthen itself as the top shopping destination for tourists in Asean. KL has the densest population, the highest income per capita in Malaysia and the highest purchasing power in the country; it is also the most visited place for domestic and international tourists.Within the KL city centre, there are a few prominent projects which are expected to be completed in the next few years including the developments in Bukit Bintang City Centre, PNB 118, Tun Razak Exchange and Plaza Rakyat. RGM said the downside of new supply is the glut of shopping centres that are currently facing low occupancy rates.Oversupply has been one of the major challenges to shopping centre owners in the Klang Valley for the past eight years, but is location specific. Top-performing malls such as Suria KLCC, Pavilion KL, Mid Valley Megamall, Sunway Pyramid and One Utama are unlikely to be affected because they are established with strong management teams, the group said. However, RGM also said no one can predict the number of shopping centres in the next 10 years because it is difficult to make such a longterm prediction as it takes about four years to plan and complete a shopping centre. 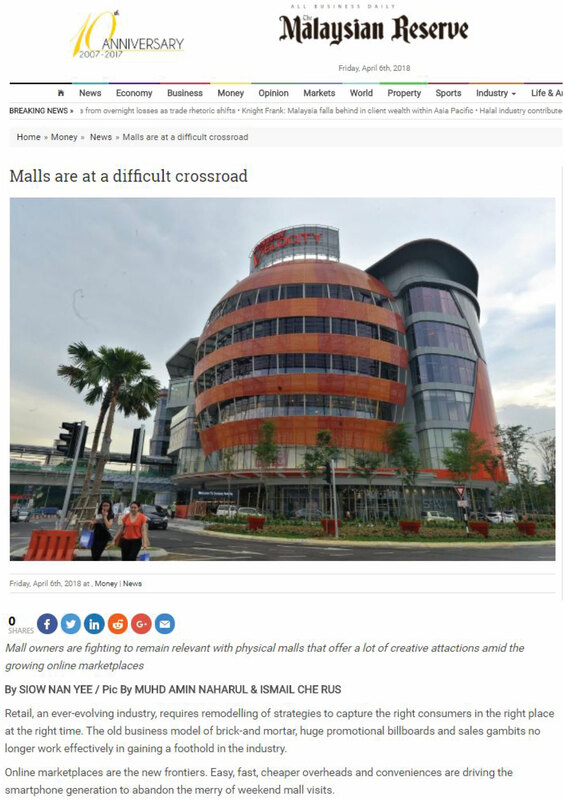 Developing and maintaining a balanced, tenant-mixed format is one of the strategies to remain relevant, be competitive and continue to grow in the retail industry.Kevin said any addition to the existing number of malls will certainly increase competition for retailers in the already “Red Ocean” KL. “A shake-out is imminent in poorly designed, managed, researched and developed malls, which will suffer a drop in occupancy rate, average rental and viability to sustain. “The population base and growth of KL, as well as the arrival of tourists, are not up near to the numbers compare to cities like Bangkok and Jakarta,” he said. Adopting a mixed pro forma will work due to its synergistic advantage over a standalone format, design, research, management, marketing and operations. “We embrace an exciting tenant mix with good depth and breadth to maintain our occupancy rate and strive in the competitive environment. “Sunway upkeeps its malls in tiptop condition and delivers experiential activities and promotions to draw the crowd in,” Kevin said. The top-performing mall said the mushrooming of new malls will pose competitive challenges, but it has the ability, capability and tenacity to meet the challenges. The moving out of Parkson Holding Bhd’s store from Sungei Wang Plaza in February this year has sparked concerns from speculations of retail apocalypse stemming from the bad economy to the obsolete faith of Sungei Wang Plaza. 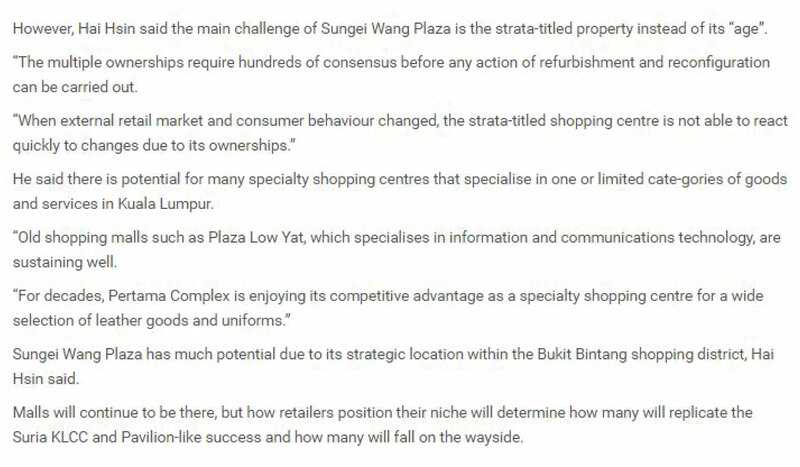 However, Hai Hsin said the main challenge of Sungei Wang Plaza is the strata-titled property instead of its “age”. He said there is potential for many specialty shopping centres that specialise in one or limited cate-gories of goods and services in Kuala Lumpur.“Old shopping malls such as Plaza Low Yat, which specialises in information and communications technology, are sustaining well. Sungei Wang Plaza has much potential due to its strategic location within the Bukit Bintang shopping district, Hai Hsin said.Malls will continue to be there, but how retailers position their niche will determine how many will replicate the Suria KLCC and Pavilion-like success and how many will fall on the wayside.